CITC has created brand new technology that will allow for 2-hour, long-lasting, water-based, 100% organic haze to be produced in a quiet haze machine named the AquaMax. 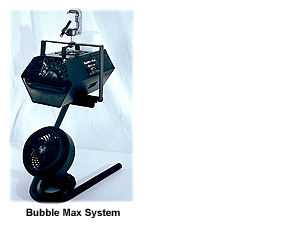 For years, water-based haze machines produced a haze that didn't last long, thereby costing thousands of dollars in haze fluid each year. For years, oil-based haze fluids have received a bad rap for leaving residue on lights. Now for the first time, AquaMax answers both of those concerns by producing a long lasting, two-hour haze without any of the residue worries of an oil-based machine. And the piece de resistance? The haze is completely organic. The machine never needs cleaning and has built-in fans to spread the "healthiest haze on earth" faster and better than ever before. Best of all, the AquaMax is super conservative on haze fluid. Lastly, the haze produces the smallest particles to date and therefore is extremely dry. Haze residue is a thing of the past. The unit includes timers, remotes, and DMX. The machine also has a low electrical requirement and a very quick heat up time. Eliminates the need for Dry Ice or CO2 by using refrigerated fog that stays low to the ground. Produces 7000 cfm of continuous, fog for over 30 minutes per use through 2 hoses 8'long. Now with higher-output Fog-accelerator-Fan and dual remote controls for fog and refrigeration system. A portable and inexpensive alternative to fog or haze machines, Fantasy FX can safely add a dreamy (or eerie) atmosphere to a room, or make light beams or laser beams come alive. It creates the appearance of fog, haze, or steam effects quickly, easily and safely. Comes with a push button top for horizontal spray (can apply the handle for a gun type use) or a snap-down top for a hands-free vertical spray that's continuous (you can snap the top up for later use). Each 30-second spray lasts about 30 minutes. Fill a dance floor room up to 15 times with one can. Safe, non-toxic, non-irritating, ozone safe, no cfcs, meets EPA standards.